High-temperature insulation wool products are used in industrial furnaces and plants up to 1800 ° C.
Continuous fibers or textile glass fibers are produced by a die-drawing process and all monofilaments have the same diameter. If the diameter and the length vary, the material is called wool. Therefore, high temperature wools are not fibers by definition and the term “refractory ceramic fiber (RCF)” is not correct. But the term is still in use. 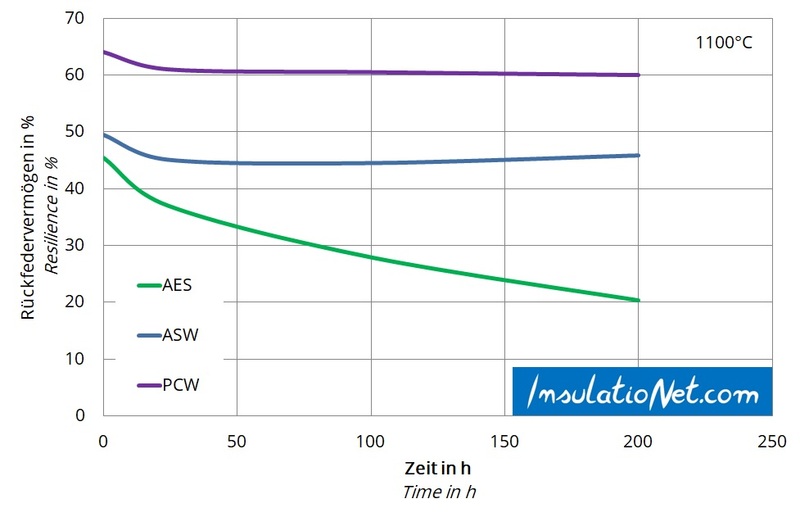 High temperature insulation wools have a very low density compared to traditional refractory materials (castables or bricks) and thus a very low heat capacity (based on the insulation mass in a furncae). The materials are resistant to temperature changes and can be heated or cooled almost as quickly as desired. This feature in combination with the low mass have fundamentally changed the furnace and kiln construction. Batch furnaces can be run faster and more energy efficient, the steel construction can be much slimmer and refurbishments/repairs can be done much faster. Aluminum silicate wool (ASW) is based on the Al2O3-SiO2 system and is in use since more than 50 years. The high-temperature wool, also referred to as ceramic fiber or refractory ceramic fiber (RCF), has fundamentally changed plant engineering and furnace construction due to its properties. Powdery raw materials (Al2O3 and SiO2 and possibly ZrSiO4) are melted in a resistance arc furnace with carbon electrodes. The melt exits below the melting unit and is blown by compressed air or squirted over rotating disks. The fiber produced has a length of several centimeters, a diameter of 2-4 microns and a teardrop-shaped head at the end. These heads as well as non-fiberized material are called “shot”. The teardrop-shaped head breaks off often. The proportion of shot in the crude fiber is between 40 and 60%. A reduction of the shot content in the finished product reduces thermal conductivity and the insulating effect improves. Bulk fiber is usually processed. The main product are fiber blankets, which are produced by needling. The bulk fiber falls on a conveyor belt and is sprayed with a lubricant (oil emulsions). This reduces the breaking of the fibers during needling. “Häkelnadeln” go through the bulk fiber from both sides and needle the blanket. The result is an endless fiber blanket, which is then cut to size. 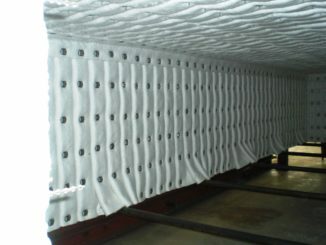 Fiber blankets are manufactured in a standardized way. The 1″ blanket is the most manufactured product. The density of the blankets is typically between 65 and 160 kg/m³. The production of alkaline earth silicate wool (AES wool) works on the same principle as ASW. Raw materials are SiO2, CaO and/or MgO. CaO as well as MgO reduce the melting temperature of the SiO2 and ensure a low biopersistence of the fiber. The biological resistance is low and the fiber is classified as “biosoluble”. The body can dissolve AES fibers within a few weeks. The production of polycrystalline wool (PCW) takes place in a different way. The Al2O3 content is at least 72% for this fiber type. Due to the high surface tension, a melt can not be blown into the fiber. Therefore, PCWs are generated via a sol-gel process. This results in a water-soluble gel fiber, which is then thermally treated in a continuous furnace. Product is a ceramic fiber. In addition to fiber blanekts, a variety of other products can be made from high temperature wool. These include vacuum-shaped boards and parts. In addition to the function as an insulating board these products are used for e.g. burner parts or kiln furniture. Fibers are converted into an aqueous suspension which also contains other inorganic fillers and organic binders. The suspension is drawn on a sieve by vacuum and a board is shaped. The boards/parts are then dried and get a thermal treatment in some cases. This process can be used to produce a variety of geometries. The gross densities of the finished products are between 170 kg/m³ and about 1300 kg/m³. This wide density range and recipe possibilities allows to produce a variety of products with very different mechanical and thermal properties. By the use of organic binders it is also possible to produce flexible papers and felts which are used as seals or “soft” insulating materials. The properties of high temperature wool are usually determined according by the series of standards “Refractory products for thermal insulation” EN 1094 1-7. Also commonly used is the classification according to ASTM C892 “Standard specification for high-temperature fiber blanket thermal insulation”. Decisive for the classification is the shrinkage of the material. 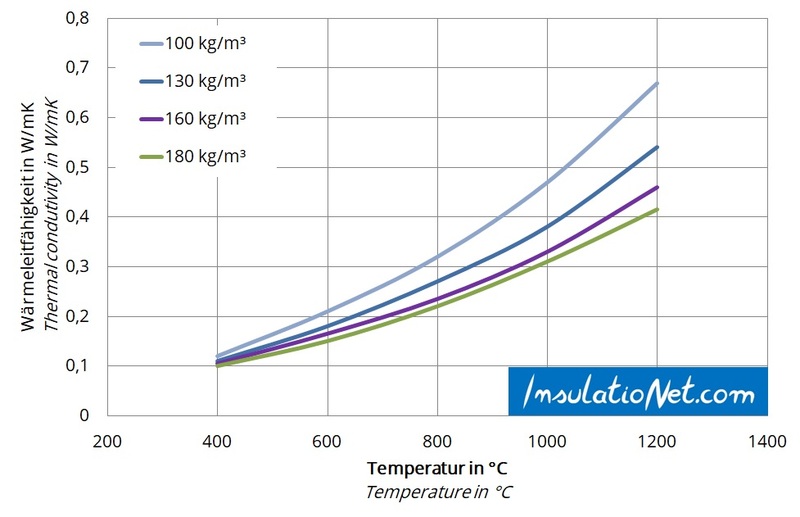 The classification temperature (according to EN 1094) is therefore defined as the temperature at which a linear shrinkage of 2-4% is not exceeded after 24h heat treatment in an electrically heated laboratory oven and in a neutral atmosphere. The exact value depends on the type of product. Boards must not exceed 2%, blankets and papers 4%. 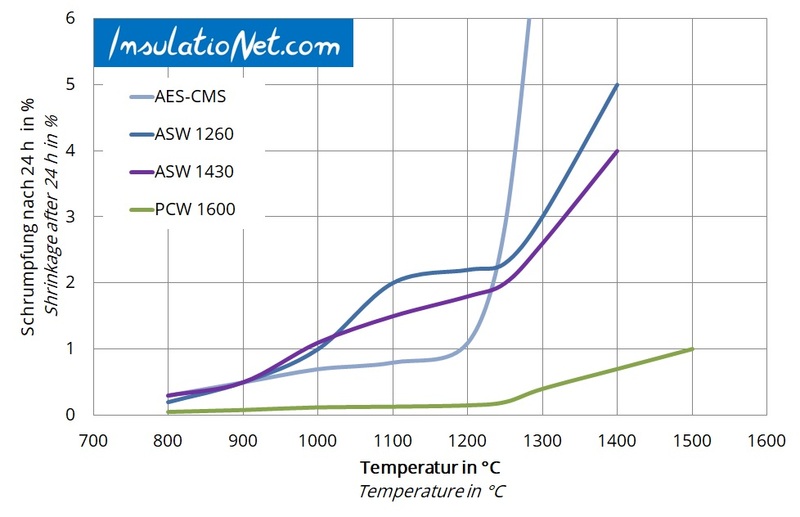 The permanent application temperatures for AES and ASW are approx. 100-150K below the classification temperature of the material. Polycrystalline wool products can also be used up to their classification temperature in some applications. High temperature wools are characterized by low thermal conductivity, low bulk density and low heat capacity. High-temperature wool can therefore be used to build very energy efficient, periodically operated systems that can be heated and cooled quickly. All high temperature insulation wools shrink at high temperatures. If necessary, newly installed insulation has to be complemented a few days or weeks after operation start. The diagram shows the typical long-term behavior of an ASW at different temperatures. Depending on the temperature, most of the shrinkage takes place in the first hours and days of operation, then the process slows down considerably. Aggressive components in the furnace atmosphere can dramatically increase shrinkage (e.g. alkalis). These corrosive components are getting into the furnace via the goods. Shrinkage does not come to a stop in this case. Although it slows down, it continues depending on the amount and diffusion mechanism of the corrosive medium. AES and ASW recrystallize at temperatures above 900 ° C. When used continuously above 900°C, these materials produce crystalline SiO2 and the vitreous structure is gone. As a result, the materials lose flexibility over time. 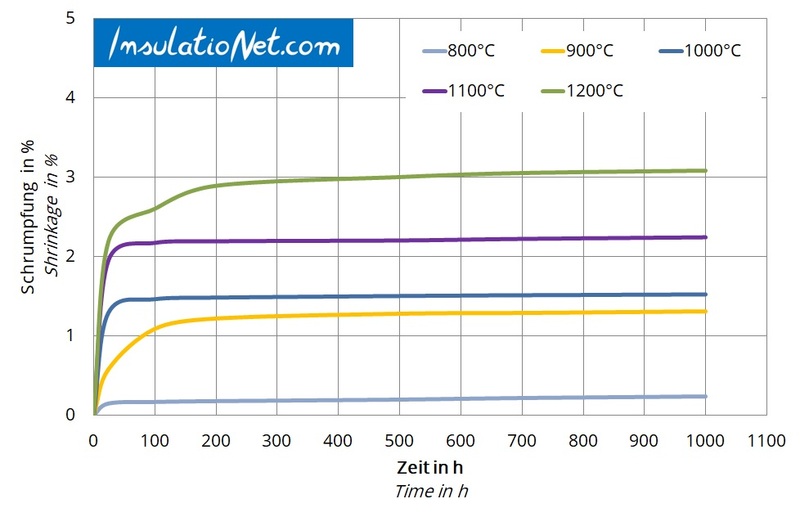 Higher operating temperatures accelerate the process. The thermal conductivity dependents on density and prefered fiber orientation. The type of material has a low impact on thermal conductivity at high temperatures. The resilience is a charcterisic property of needled blankets. Resilience changes on the amount of compression (at a certain point the fibers break) and on the thermal load (recrystallization). The diagram shows the typical time-dependent resilience after firing at 1100°C (blankets with a raw density of 130 kg/m³). The AES material (classification temperature 1200 ° C) is already overloaded. The resilience behavior is important for the use of modules. Precompression in a module and thus in the furnace wall counteracts shrinkage (shrinkage) at high temperatures. The use of modules has other advantages. The higher bulk density of the material and reduces the thermal conductivity at high temperatures and thefore reduces the heat transfer. Preferred fiber direction is perpendicular to the furnace wall. As a result, modular systems can withstand flow velocities up to 30m/s. If the blankets are installed in layers 10 m/s should not be exceeded, otherwise fibers from the material will be blown away/eroded. ASW and PCW are chemically very stable and also withstand acidic atmospheres. AES wool can not. People often disregard that the dew point of acids is higher than the dew point of the water. For example, sulfuric acid condenses at about 160°C. Also critical are pure water condensates in the wall. AES should not be used in such conditions (also not in HF, H3PO4, H2SO4, NaOH, KOH containg atmospheres). We will devote a complete section to the corrosion of refractory materials (is in progress). In 1997, aluminum silicate wool (ASW) – “refractory ceramic fiber (RCF)” – was classified in category 2 (Directive 67/548/EEC). Substances classified as carcinogenic to humans have been categorized into this category. It was sufficient evidence to support the well-founded belief that exposure of a human to the substance can cause cancer. ASW has been labeled with hazard symbol T and R 49 – “May cause cancer by inhalation”. With the CLP Regulation 2008, classification had changed to Category 1B – “Substances likely to be carcinogenic in humans – the classification is predominantly based on evidence in animals”. Since then, ASW and some ASW products carry the “health hazard” symbol with the H350i note “Can cause cancer when inhaled”. In 2010 aluminum silicate wool was included in the Candidate List of Substances of Very High Concern (SVHC). The “substance” was not added to the admission list (REACh Annex XIV). Currently, there is a search for a more practical approach (e.g. changes in occupational safety and health at European level). Alkaline earth silicate wool (AES) is not classified as it complies with the discharge criteria set out in Note Q of the CLP Regulation. Polycrystalline wool (PCW) is not classified according to the CLP regulation, therefore labeling is not mandatory. In Germany PCW belongs to the group of inorganic fibers – according to technical rules for hazardous substances (TRGS) and is classified in category K2 “suspected carcinogenic effects in humans” (TRGS 905 “List of carcinogenic, germ cell mutagenic or reprotoxic substances”). Since the technical rules for hazardous substances have a quasi-legal status some manufacturers in Germany also label polycrystalline wool. Classification has severely limited the use of aluminum silicate wool in many European countries. AES wools have completely replaced aluminum silicate wool in the household sector as well as in fire protection. In industrial application it is more complicated due to the low chemical and thermal resistance of AES wool. In Germany, TRGS 619 “Substitution for aluminum silicate wool products” gives a guideline to application-specific substitution. The handling of aluminum silicate wool as well as polycrystalline wool is regulated by TRGS 558. The TRGS has recommendation character for PCW. In TRGS 558, activities are classified into risk classes that result in organizational and occupational health and safety measures. The acceptance concentration is 10,000 f/m³, the tolerance concentration is 100,000 f/m³ (according to TRGS 910). At European level, the Scientific Committee on Occupational Exposure Limits (SCOEL) recommends an occupational exposure limit of 300,000 f/m³ (8 hours TWA). The National Institute for Occupational Safety and Health (NIOSH) recommendes exposure limit (REL) for RCFs of 500.000 f/m³ as a time-weighted average (TWA) concentration for up to a 10-hr work shift during a 40-hr workweek. However, due to a residual risk of cancer (lung cancer and pleural mesothelioma) may still exist at the REL, continued efforts should be made toward reducing the concerntration to 200.000 f/m³.